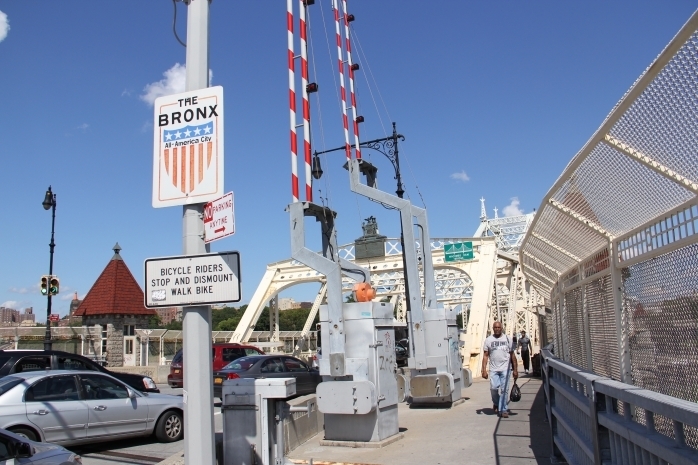 Beginning in the summer of 2015, the New York City Department of Transportation’s Office of Bicycle and Pedestrian Programs has led a community-driven planning process to increase pedestrian and bicycle safety and mobility between Manhattan and the Bronx across 13 Harlem River bridges. Through workshops, surveys, and mobile outreach, combined with technical analysis, NYC DOT is identifying community preferred transportation improvements to create a continuous cross-borough user experience, incorporating bridge paths, approaches, wayfinding and lighting. The final product of this process, the Harlem River Bridges Access Plan, will be a planning document used to guide future investment and seek funding for capital projects. The planning process includes three series of DOT-led community workshops, with two workshops on each side of the Harlem River, for a total of 12 workshops. DOT Street Ambassadors have been conducting on-bridge outreach throughout the planning process. The Access Plan addresses neighborhoods on both sides of the Harlem River within roughly one mile of 13 Harlem River bridges. The study area includes sections of Community Boards 9, 10, 11, and 12 in Manhattan and Community Boards 1, 4, 5, 7, & 8 in the Bronx. The primary focus of the plan is on the development of short- and long-term improvements on the bridges themselves, at intersections near bridge ramps, and along corridors connecting bridges to major destinations for pedestrians and cyclists.